The leader in lenticular event photography and social sharing. Providing equipment, software, training, supplies & more to the industry since 2001. 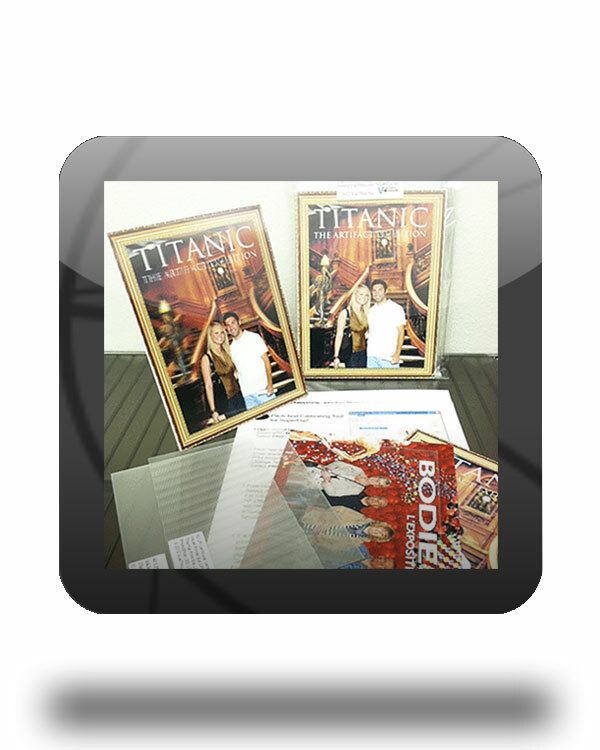 In the package are 3 Printed Samples (1 - 3D, 1 FLIP, and 1 3D Photo Frame) finished and attached to the lenticular lens. From Steve Hampton of Jacksonville, Florida on 8/10/2016 . Great products, and super fast shipping. Thanks! From Anonymous of New Braunfels, Texas on 6/16/2016 . Nice examples of my new product offering in my event photography business in the San Antonio and Austin areas. Snappy Snapshots Photography. Thanks Vuethru! From Alvaro Bobadilla of Miami, Florida on 10/30/2015 . Excellent service and excellent product. you rock! From Anonymous of augusta, Georgia on 11/27/2014 . Vue thru is jest what you are looking for if you like to make 3D and flip photo.The pro gran are the best to work with and understand. From Anonymous of westminster, California on 1/30/2013 . quick shipping and provide a lot of information. From Ron of Buhler, Kansas on 1/16/2013 . From Anonymous of Minneapolis, Minnesota on 12/29/2012 . Excellent sample kit and very affordable! I am amazed that these can be made at home...they are just the bomb (American slang for absolutely super fun). 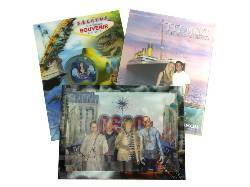 The kit is a great way to get started with lenticular printing. From ahmet alkan of KONYA, Turkey on 11/24/2012 . From Caleb of Griffith, Australia on 11/13/2012 . Product well exceeded my expectations with the amount of in-depth information and guides of the Lenticular printing process. From Anonymous of Paris, France on 10/2/2012 . Very complete, very usefull to have an idea of the product and how it works. Totally worth it for its price. From Eileen of Silver Spring, Maryland on 9/27/2012 . I was so impressed with the sample kit, disk and directions provided in the sample pack from VUeThru. I ordered the pack to see if it would be a project I could use with my students for our upcoming technology night and as an introduction for our tech club on 3D images. I am in the process of getting ready to order additional supplies. I think VueThru is fantastic and am looking forward to some of the great work the students will be able to produce. From Mitesh Tamboli of Melbourne VICTORIA 3128, Australia on 8/13/2012 . From Reatha Carey of Oklahoma City, Oklahoma on 4/28/2012 . Can't wait to order some flip it lens. Saving my pennies now. From Howard Goldbaum of Reno, Nevada on 4/28/2012 . The sample pack, and other educational material VueThru led me to, helped me to jump-start my lenticular work. From Andy H of Warrington, United Kingdom on 2/29/2012 . The 3D and FLIP Sample Pack does what you want and gives you a cheap way to get your hands on some samples you can use. Also gives you some great help with the premade samples and advice sheets. You wont be disapointed! From vijay mukhi of mumbai, India on 2/14/2012 . Printing in 3d is very difficult and hence if one has to demonstrate the use of 3d we need great looking samples. I loved the samples and so does everyone i show them to. You should have more samples on sale. From Sam Hill of Chicago, Illinois on 1/26/2012 . The printed instructions were very easy to follow and the samples were extremely helpful. A great product from a great seller. Thanks a million. From janice worden of Evanston park S A, Australia on 1/20/2012 . I think the product and idea is great, but I have a lot to learn and a lot to practice before I try the screens. From Rafael Guillen of San Salvador, El Salvador on 10/11/2011 . Everything was in my hands as expected, good service. Thanks a lot. From Anonymous of San Francisco, California on 10/8/2011 . This is exactly what I expected. There are several samples of lenticular screens available. There is also several pages of useful instructional text. This is a great starter pack and the price is really just to pay costs--they aren't making money off of this. The sample 3d images are the easiest kind of flip images. I would have liked to have seen more challenging multi-position animations that will give a better idea of the limitations of the lenses. From Anonymous of Portland, Oregon on 10/6/2011 . The sample pack is a great intro to DIY 3d lenticular, together with the free Flip software you are ready to start creating for under $20 bucks. Please read our legal page before using this site.